How to Fix ERR_CONNECTION_REFUSED Error in Chrome? You turn on your computer like any other day and try to access YouTube to Watch some videos. All of a sudden you see it, ERR_CONNECTION_REFUSED where YouTube should be. This is an error that can appear on your Chrome browser for no apparent reason, but that has an easy fix. Yes, you can fix ERR_CONNCETION_REFUSED error easily. Even if you accessed YouTube or another site, for some reason today, you can’t. You may read that a solution is to use a VPN, but that’s not a permanent solution. To fix ERR_CONNECTION_REFUSED error in Chrome, you’re going to have to do some cleaning and get rid of some digital junk. But, before you get into any of the methods of fixing ERR_CONNECTION_REFUSED error in Chrome, first make sure that the site is not down. The problem could easily be fixed with a simple refresh or waiting it out. If you’ve tried this and the error is still there, here are some methods you can try. What is ERR_CONNECTION_REFUSED and What Causes The ERR_CONNECTION_REFUSED Error? Some malware or virus has managed to get through. The network connection can’t get through because of a security software or an Adware program. Firewall is blocking the site the user is trying to access. The Net Intelligence program considers that site a threat for some reason. If you don’t get along with technology, the last thing you want to do is to get into anything technical. Rebooting your WiFi Router is the least technical solution you can try. It’s not about just turning it off and on right away, long-press on the power button for ten seconds and release. Wait for ten seconds and then turn it back on. Check to see if you can access the site again. If this didn’t work them, it’s time to get your hands dirty. To flush the DNS, you’ll need to open the Command Prompt. You can open it by right-clicking on the Windows Start menu and choosing that option. Make sure that you open the Command Prompt with administrative privileges or else this won’t work. Type in the following command: ipconfig/flush and wait a few seconds. When the process finishes, the Command Prompt will show you a message that the DNS cache all is clear. Go ahead and reboot your computer and try to access the site again. If you still see the ERR_CONNECTION_REFUSED error try the following method. If refreshing the DNS didn’t work, looks like you’re going to have to try changing it. This is going to involve going into your computer’s settings, but it’s not complicated at all. First, you’ll need to open the Network and Sharing Center. If you’re on Windows 10, you can do this by typing network and in the search area, and the option should automatically appear. For Windows 7 users, you will see the Control Panel by right-clicking on the Start Menu, and the option should be on the right side. Last but not least if you’re a Windows 8 user, you’ll need to right-click on the Start Menu and find Control Panel in the list. Now that you know how to access the Network and Sharing Center click on Network Adapter (WiFi, LAN, Ethernet) once it’s open. Click on Properties and then choose Internet Protocol Version (TCP/IPv4). Click on that option’s Properties and a small window will appear. 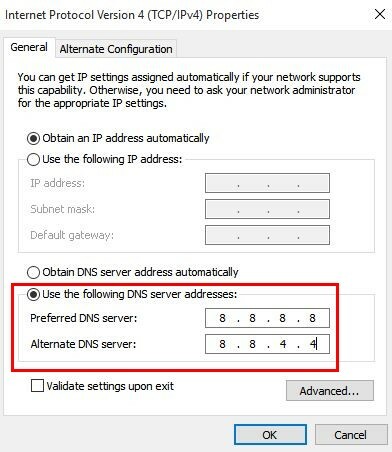 Towards the bottom, make sure to choose the option that says Use the following DNS server address. After that, the numbers in Preferred DNS Server need to be all eights with a dot in between each number. In Alternate DNS server, the numbers need to be eight, eight, four, and four with a dot in between each number. Double check to see that everything is selected correctly and then click OK. You should now be able to re-access your sites and the ERR_CONNECTION_REFUSED error might have gone away. If you notice that you started getting this problem right after installing an extension, using a VPN, or after making any changes to your antivirus they could be the culprits. Uninstall the last extension you added, disable/uninstall the VPN or undo the changes you made to your antivirus. Your browser’s cache could be corrupt and could be interfering with your browser. By clearing your browser’s cache, you get rid of this useless data, and hopefully, it will get rid of the error you’re seeing. If you notice that you only get the ERR_CONNECTION_REFUSED error with a particular website, this could very well be the reason why. 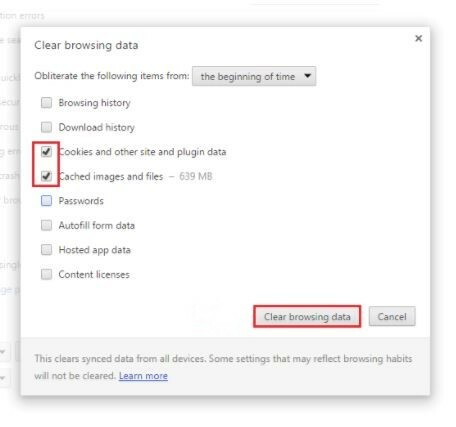 To clear the browser’s cache type the following in Chrome’s address bar: chrome://settings/clearBrowserData and then press Enter. When a window appears, you’ll see a series of options, but the only ones that need to be selected are Cookies and other site and plug-in data and Cached images and files. Once those two options are selected click on the Clear browsing data button on the bottom right of the window. Don’t forget to see if you can access the site now. Hopefully, this might have fixed the ERR_CONNECTION_REFUSED error in Chrome. If not, stay tuned! Once you’ve entered all of these, press Enter and restart your computer. You should now be free of that annoying ERR_CONNECTION_REFUSED error. Also Read: How to Fix ERR_EMPTY_RESPONSE – No Data Received Error in Chrome? What? It’s still there. In that case, try the following method. By now the Command Prompt should be your best friend. Open it once more with administrative priveledges and run this command: ipconfig/renew. This is going to give you a new IP and a DHCP configuration. Don’t panic if it disconnects you from the Internet. This is only temporary, and you should be back online in no time. See if the error ERR_CONNECTION_REFUSED has gone and the site will load now. If yes, it’s fine. If not, you need to dig deeper. Keep reading! There are times when a simple reset of the Proxy settings will do the trick. You could have used a proxy server, but you merely forgot to restore the settings back to default. If it’s not already open, launch Chrome and click on the hamburger icon on the top right. Click on Settings and when a new tab appears, scroll all the way down until you see Show advanced settings. Once that’s open scroll down on more time until you see the Network section. Under that option click on the button that says Change proxy settings. After the new window appears, click on LAN settings at the bottom. 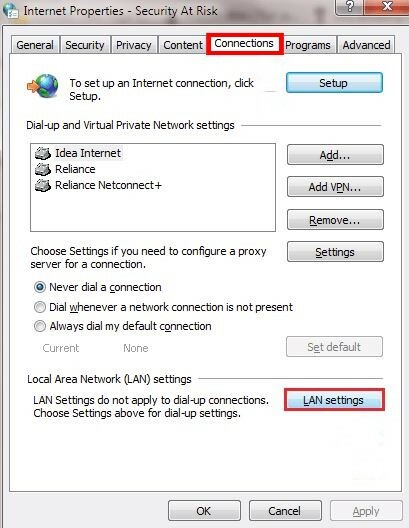 Right under proxy server, you’ll see the option that says Use a proxy server for your LAN (These settings will not apply to your dial-up or VPN connections. Make sure you uncheck it. When you’re done, you’ll need to restart your computer. The next time you access the site, you shouldn’t have to see the ERR_CONNECTION_REFUSED error message anymore. It can be difficult to pinpoint why your Firewall may be causing this problem in the first place. But, the good news is that with some simple modifications, it won’t be getting in the middle of you being able to access your favorite sites. Search for the Firewall in your computer and launch it. To the left, you will see an option that says Allow an app or feature through Windows Firewall. Find and click on the Change settings button and look for Chrome in the list. Once you’ve found it check all the options that are available and the last step would be to click OK. Try to reaccess the site if the error ERR_CONNECTION_REFUSED might have gone. Some users have opted to uninstall and then reinstall Google Chrome. Some might consider this a drastic measure, but it just might work. To uninstall Chrome, you’ll need to go to the Control Panel one more time. Look for the option that says Add/Remove Programs or Programs & Features. Make sure yo erase all crash reports subfolders you can find. You can find them under C:\Users\%your_name%\AppData\Local\Google\. After Chrome is gone, go to Chrome’s official site and download the latest version for your desktop. Don’t forget to check out the fastest web browsers for Mac and best web browsers for Windows users. If you love taking risks, then you can try disabling your antivirus. It could consider the site you want to access a threat, but you know that it’s not. Since antiviruses don’t negotiate, you have no choice but to disable it. Click on the show hidden icons button on your taskbar and right-click on the icon of the antivirus. Depending on what antivirus you have you will either see an option to turn it off or to pause protection. Click on whatever option you see and then select Turn off Real-time Protection. The wording might differ slightly depending on the software you’re using. The last step would be to try and access the site to see if you still get the ERR_CONNCETION_REFUSED error message. 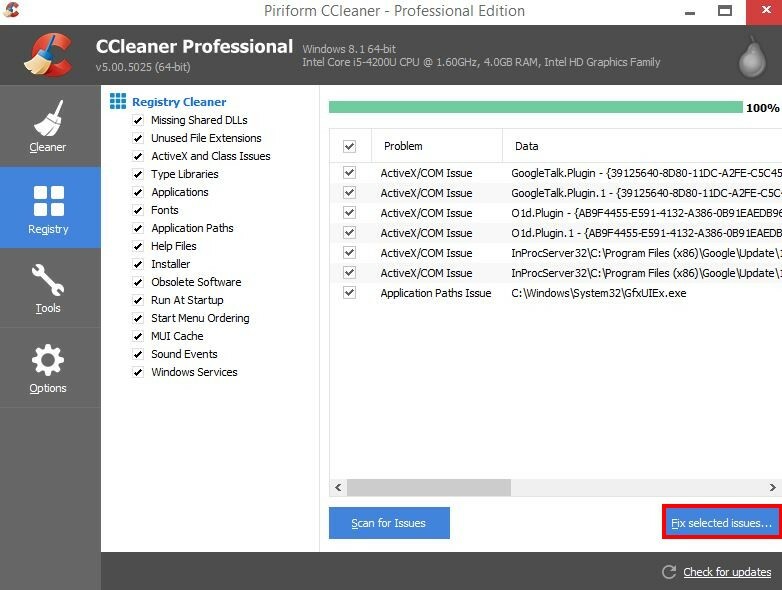 Windows users have reported that once they gave their registry a cleaning, the ERR_CONNECTION_REFUSED error message went away. This is a possibility because if malware did make its way into your computer, it could have made some entries you’re not aware of. One of the best malware removal software that I recommend that you use is CCleaner. It’s a trusted and popular software that will get the job done. Once the software has downloaded and you’re looking at the main page, click on the registry option that will be the second option down to the left. Click on the Scan for issues button and wait for it to finish. When it’s done, you will see a list of all the errors it found. The software will also ask you to backup your registry before it’s cleaned. The last step would be to click on Fix selected issues and to restart your computer. ERR_CONNECTION_REFUSED – that Chrome error doesn’t have a chance against all the methods you can choose from to fix it. Hopefully, you will only need to use one to fix the problem. Which method are you going to try first?